Michael J. Shanahan, Christine Copley and John Torres in Pedro Castillo is Innocent. BOTTOM LINE: Pedro Castillo is Innocent is a meaningful attempt to dramatize the important story of wrongfully imprisoned Fernando Bermudez. Presented during the week of Adnan Syed's (of the popular podcast Serial) post-conviction relief trial in Baltimore, and shortly after the debut of Netflix’s Making a Murderer, the Textile Company’s new play Pedro Castillo is Innocent, by Claude Solnik, is unfortunately relevant and topical. Solnik’s play was inspired by the case of Fernando Bermudez, an innocent man who was wrongfully imprisoned for murder, and was then found to be innocent and was acquitted after serving 18 years in prison. The fictionalized version of the story is based on Bermudez, but in the play, the lead character is called Pedro Castillo. John Torres gives a strong and anchored performance as Pedro. He plays Pedro with empathy and intelligence, allowing the audience to connect to his situation and care for the outcome of his case. Samantha Masone as Kaela, and Christine Copley as Gwen give nice supporting performances as Pedro’s daughter and wife, respectively. Thomas Gonzalez designed the lighting, and lighting and sound in performance are handled by Alex Vartanian. Charles Calabrese composed the original music. The play humanizes Pedro by showing us his love for books and his concern for his family; in addition, we see the job Pedro has in prison that includes putting together the work schedules and working in the kitchen. The problem with the play lies in what Solnik has chosen to be the focus of the story, which is about this fictional character and his family. What are most interesting, to me, are the actual facts of the Bermudez case and how he was wrongfully imprisoned in the first place. These details of the supposed crime are glossed over and not fully explained, leaving a lot of the actual plot unexplained. There is also a lot of stage time focused on an imaginary parole board, which generally doesn’t occur if someone proclaims innocence, and did not occur in Bermudez’s case. Maybe there is a life rights concern, but it’s hard for us to give complete attention to a criminal story where the circumstances aren’t clear. We know that he is accused and convicted of murder but the details are vague. The play mentions his appeal was denied but we aren’t told why. The aforementioned modern true crime stories provide depictions of both the trials and how they affects the people involved and those around them. Unfortunately Pedro Castillo focuses only on the latter. The Textile Company deserves praise for taking on such a project. The stories of those who are wrongly imprisoned in America are fascinating, and definitely something that is worth exploring, but I have to wonder if the play would have been more successful if they had stuck to a completely factual or completely fictional story, rather than somewhere in between. Pedro Castillo is Innocent is written by Claude Solnik. Directed by Danielle C.N. Zappa. Lighting Design is by Thomas Gonzalez. Light and Sound is Alexander Vartanian. Original Music is by Charles Calabrese. 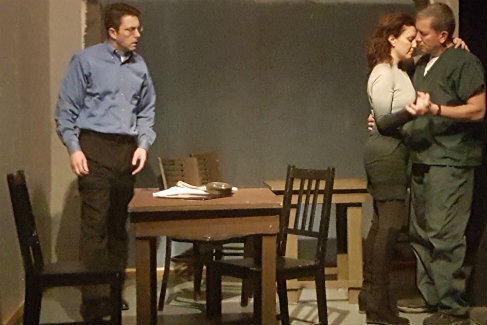 The cast is Michael H. Carlin, Laura Leigh Carroll, Christine Copley, Samantha Masone, Michael J. Shanahan, Stephanie Sottile, and John Torres.